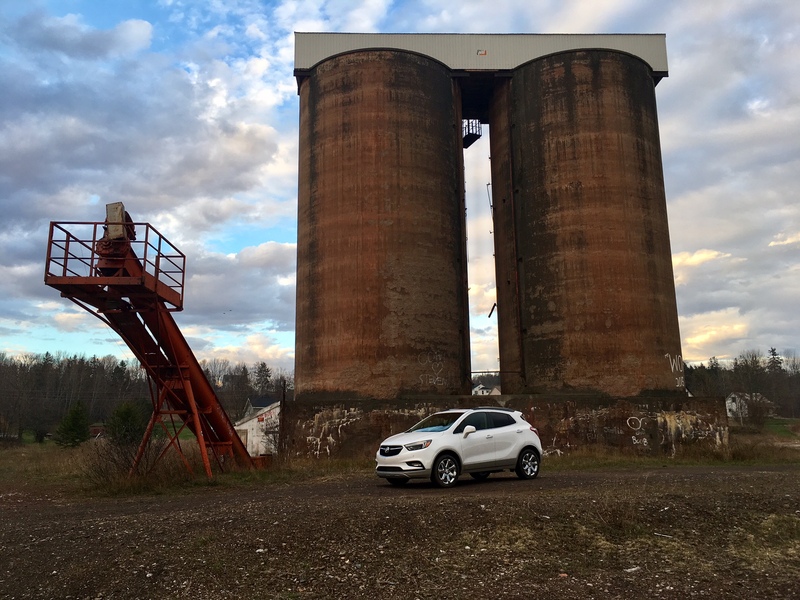 You may have recently come across some television advertising from Buick where a diverse young group of people, living their fashionably chic lifestyles suddenly become taken with a vehicle out in the wild that is dumbfoundedly unrecognizable to them. Then there’s a commercial where a valet is trying to fetch a Buick owner’s car, but can’t seem to spot it in a sea of German luxury imports. When he eventually locates it by using the key fob, he has his “that’s a Buick? !” moment too. There seems to be to be some confusing messaging going on here. 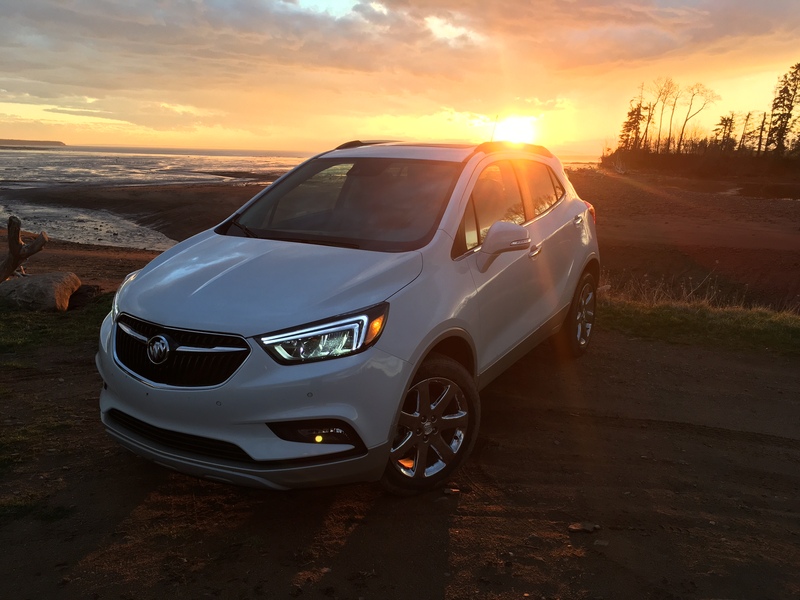 The idea in the first commercial, and many more like them, is that Buick has reinvented itself to the point where it is no longer recognizable. Therefore people stop and take notice trying to figure out what it is. Then in the second commercial, the idea is that the car is so unrecognizable that it blends in. So which is it? Does it have style that makes you stop and ponder, or do you even notice it in the first place? 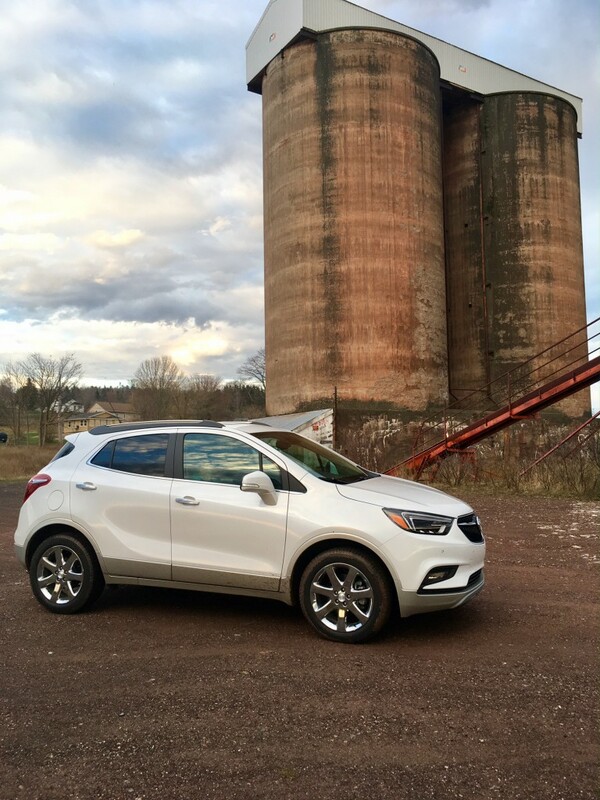 With this in mind, I had to wonder this very same thing when trying the smallest Buick for a week, though my wonder didn’t so much have a lot to do with styling, but more what Buick is hoping to achieve with the refreshed Encore. As far as styling goes, it certainly adapts Buick’s latest design language and the end result is overall classy. Though from certain angles this thing just looks pretty darn adorable, as if it were just born from the tailpipe from the larger Enclave. Awww, look at the little thing! My tester’s highest trim level provided standard LED headlights with LED turn signals, and rather nice (and expensive; a whopping $1,200 option) tricoat white frost paint. It’s been a while since I’ve seen a two tone paint scheme on a new vehicle, but it isn’t tremendously out of place. 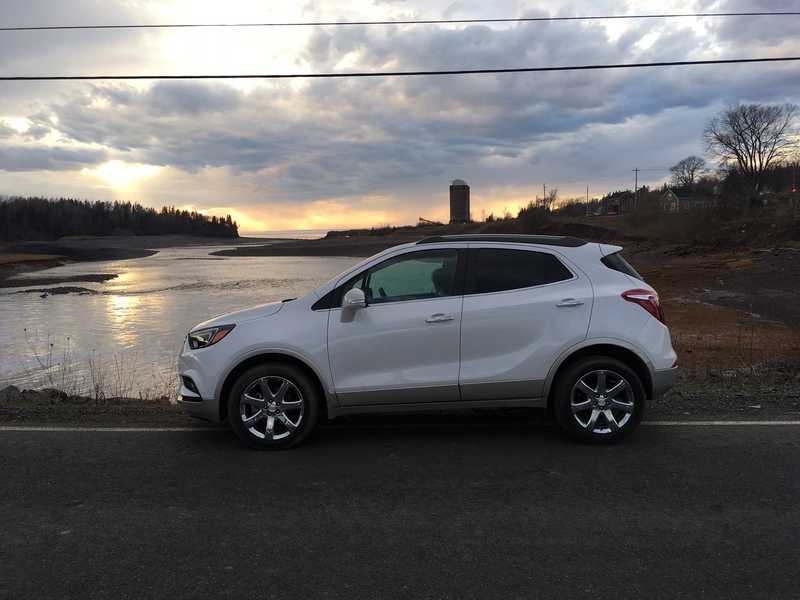 The optional chrome 18 inch wheels helps the Encore to stand out. Er, or, I mean blend in. Which is it that you want to achieve again, Buick? For as good as it looks overall, I didn’t catch anyone having a ‘that’s a Buick? !’ moment as I drove past or when I came back out from a store to the parking lot. GM took the opportunity to refresh the interior which features a new centre stack design that is much more pleasing to the eye and more intuitive to use. It also eliminated the onslaught of buttons that plagued Buicks from the past. But speaking of the past, you’ll be reminded of it as the old steering wheel design is still present along with the flimsy turn signal stalk and tired looking gear lever. I’m not sure why Buick wouldn’t take take from the parts bin of the new LaCrosse or Envision for a more complete up to date look. It makes the interior refresh seem a bit half-assed. Luckily, the brandy leather seats help the Encore seem fresh and they look tremendous. You’d expect plush comfortable seats in almost any Buick and while they are certainly adequate, I’m not entirely sure they could be labeled as plush. I don’t think they could be labeled as being particularly luxurious either with only one arm rest available for the driver, which is immediately noticeable to any front passenger by the way, and a driver’s seat that is only half powered. The Encore is a narrow car so you’ll feed as if you’re sitting directly next to your passenger as if you are in the stands at a hockey game. That doesn’t exude luxury either. However, in terms of head room, I’m sure even Shaquille O’Neal would have few complaints. You’d think being a sub-compact SUV, there would be at least a decent amount of cargo room. 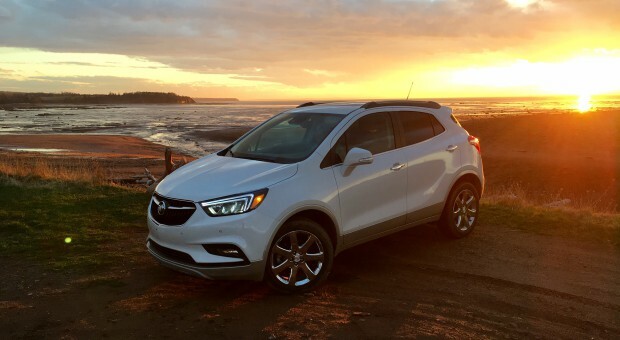 But with its 18.8 cubic feet of cargo room, you’d best leave the Encore for grocery getting duties only. 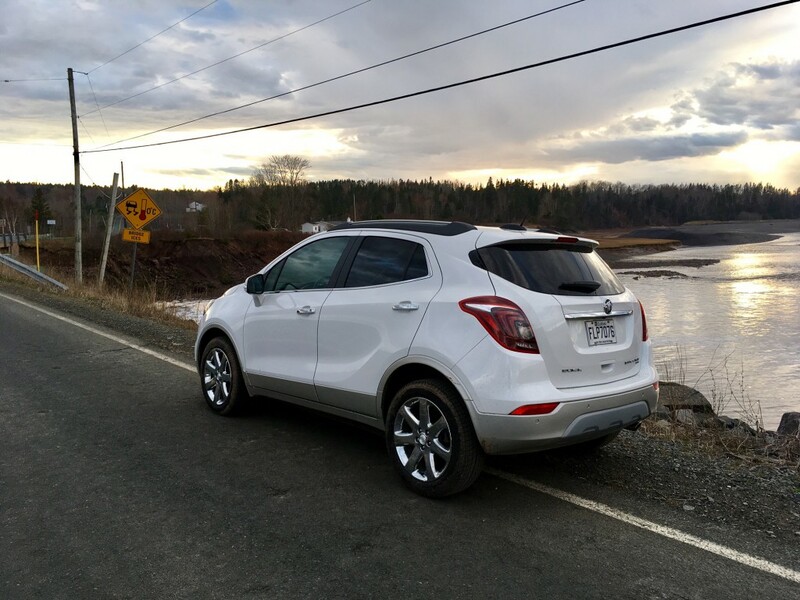 Perhaps the biggest news with the new Encore is the availability of a new engine. You can now get a 1.4 litre turbocharged 4-cylinder which makes 153 horsepower and 177 pound feet of torque. So why then, did GM decide to send a press vehicle with the old 1.4 engine that only makes 138 horses and 148 pound feet of torque? Your guess is as good as mine because the Encore desperately needs the added boost of the new engine option. To be clear, 138 horsepower likely suffice for daily driving around town or in areas where you’re doing more stopping than going. But if you are the type that likes to have a bit more of a spirited drive, you won’t find it here. 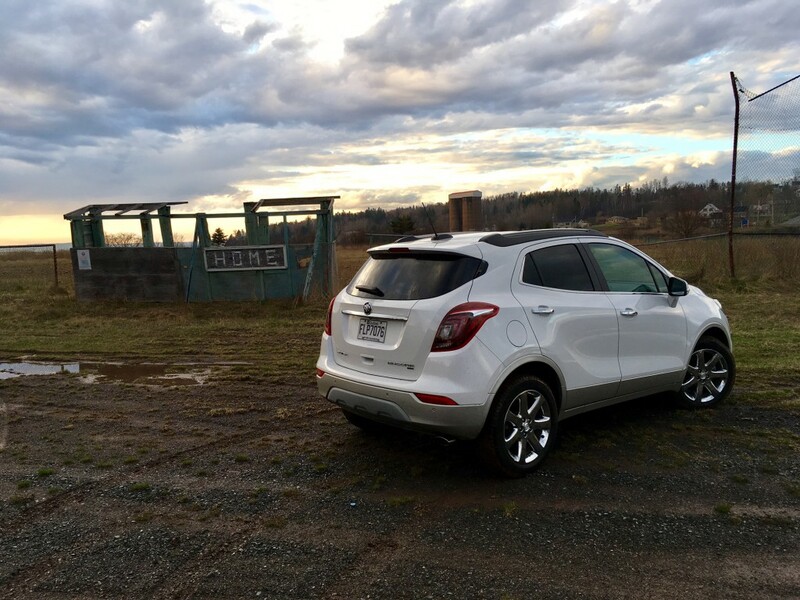 The Encore is slow and it doesn’t even pretend that it isn’t as the six-speed automatic is a bit lazy and dimwitted, repeatedly passing up ideal opportunities to downshift. 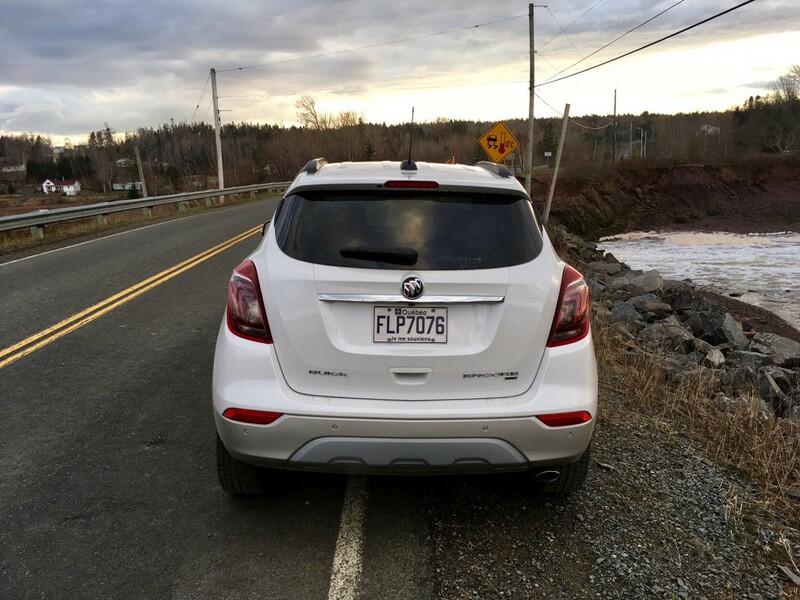 While the lack of power will leave you frustrated more often than not, especially while trying to pass on the highway or keep up with the flow of traffic, you will be pleasantly surprised at how quiet the Encore is. For a small vehicle with short wheelbase and a narrow tall body, its hushed ride is actually an impressive feat. As is the comfortable ride. Now that’s a Buick. However, driving a small, tall, narrow vehicle at higher speeds makes for a bit of an unnerving experience when the harsh winds of Mother Nature can push it about so easily. Likewise, when taking a corner at higher speeds. It’s a bit strange because the Encore feels nimble and tossable around town at lower speeds. But to keep the Encore strictly as a city slicker would do the engine’s efficiency abilities a bit of a disservice. With a lot of highway driving, I was able to return 8.2 L/100 kms. That’s very good and even driving it around town didn’t terribly increase that number either. However, after a week spent with the adorable little Encore, in a way, I can understand the confusing messaging because I’m not entirely sure GM knows what the purpose of the Encore is either. If it’s meant to be a luxury compact SUV, then it is severely lacking in some key luxury items, not least of which is the lacklustre engine under the hood. And at my tester’s as tested $37K price tag, you can get yourself into a very nice, just as luxurious, and bigger fully loaded GMC Terrain. And if all you care about is the premium name, then get yourself into an Audi Q3 or BMW X1. Those name plates are sure to depreciate less. On the flip side, if the Encore is meant to be more of an premium entry, startling segments the way Volvo does, then perhaps its $23K starting price is enticing. But then again, if you want something that’s cheap, why not save yourself five grand and get a fully loaded Chevrolet Trax, which is essentially the same vehicle as the Encore? 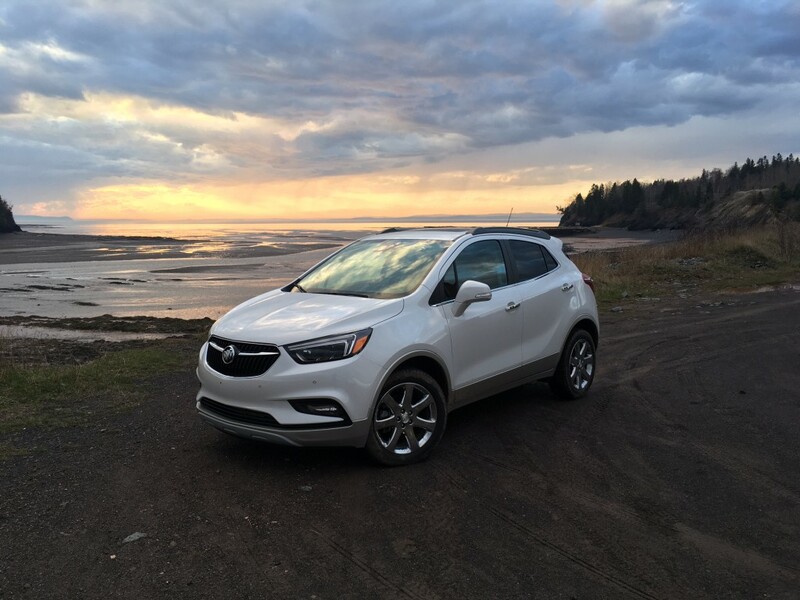 Clearly some people have figured it out though, and they don’t seem to find any issue with the Encore’s worth as it is the best selling vehicle the brand currently makes. So, what do I know? What does Buick know? Perhaps, they know there is a sucker born every minute or maybe the Encore’s upsides are enough to negate its downsides. Improved exterior styling, now made cute!